A NEW Morning Sun title in which we have prolific 'Trains' magazine author Jerry A. Pinkepank describing NYC's late steam and diesel power. 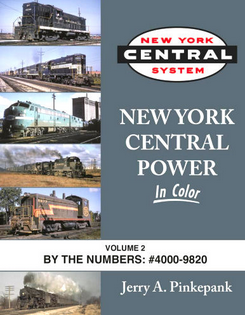 Jerry presents New York Central's fleet in color with authoritative captions. 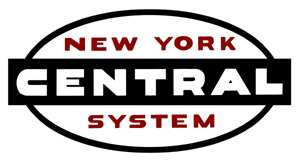 This is Jerry Pinkepank’s second volume dealing with NYC’s diesel, electric and fleet steam locomotives. Jerry is both a former NYC employee, and NYCSHS member. 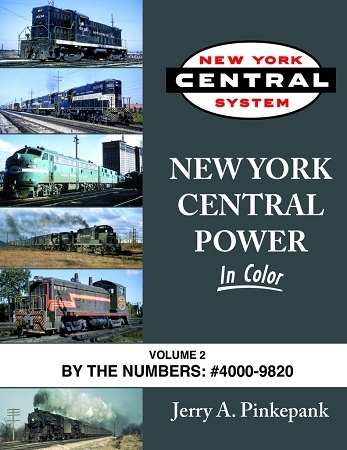 Like the first volume, this book explains how each model and number series fit into NYC's changing operation. For diesels, the evolution from first to second generation models is amply illustrated. Steam is covered with here-to-fore unpublished photos, … some from Jerry's personal slide collection. Both fleets are covered by locomotive number and series; with this volume starting with E7 #4000 and progressing to #9820 (an 0-8-0?). Remember, in the 1970's Jerry wrote Kalmbach's "Diesel Spotter's Guide". He knows his subject matter, so the picture captions alone are well worth the book's price. Morning Sun Books, hardcover with dust jacket, printed in China, copyright 2016, 128 pgs., 8.5 x 11 x .5 in., abt. 300 captioned color photos. NYCSHS members who are signed into their accounts will enjoy pricing at 20% off retail; Ohio residents must add 8% sales tax.